The Weather Channel says that it’s currently 92 degrees Fahrenheit outside (about 30 degrees Centigrade). That’s hot enough to do nothing but just sit around inside watching television and drinking cool liquids. But, to do that today would be something close to culinary sacrilege. 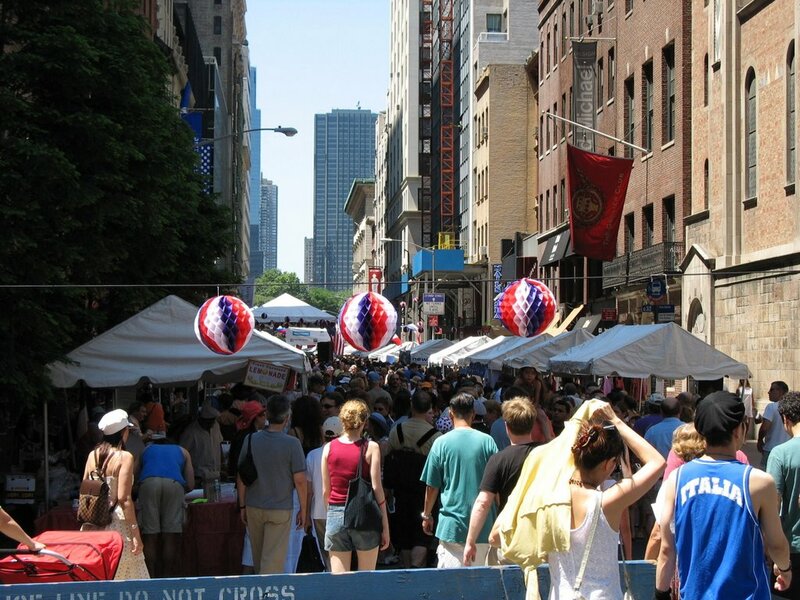 New York summers and street fairs go together like, well, just about anything you can think of to combine. 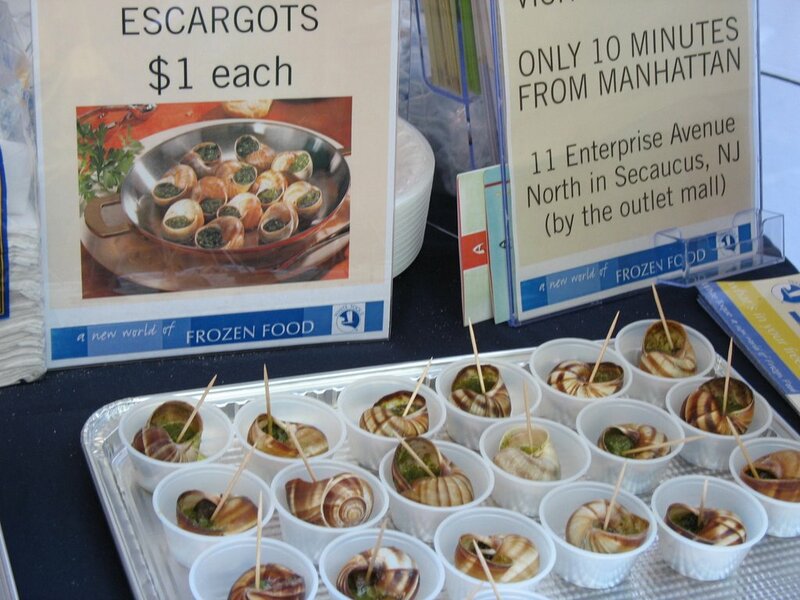 To the uninitiated, these may sound like great fun: food, crafts, vendors, etc. all in a few city blocks. To those who get to live with them, they are experienced with the same measure of ennui and tolerance of the many themed parades that close down Fifth Avenue several times a year. They shut down bus routes, cause detours, change well-laid plans, and cause mounds of frustration. There is, however, one special fair that takes place each year on a Sunday in mid-July that draws out the folks who most likely don’t usually brave these spectacles. 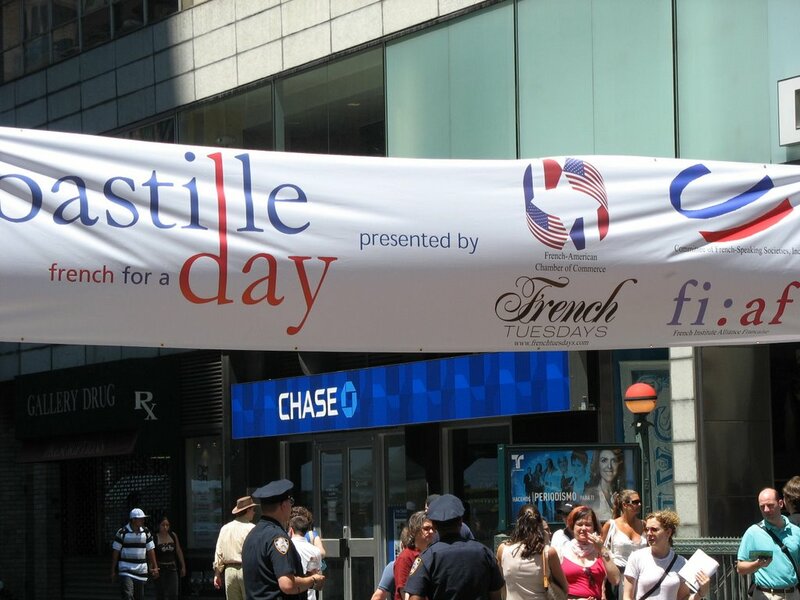 The Alliance Française in New York holds its Bastille Day celebration in Midtown Manhattan, taking over three blocks on 60th Street. 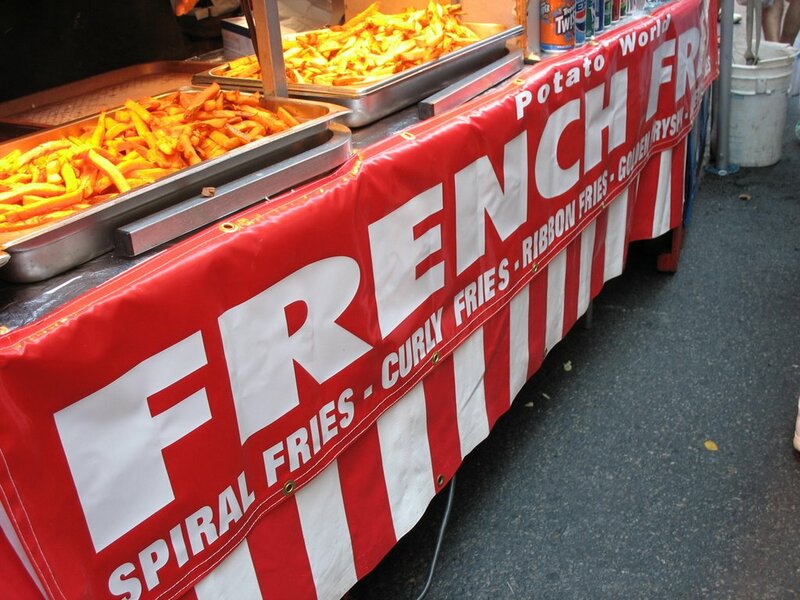 Local proprietors, restaurants and many things French are featured. 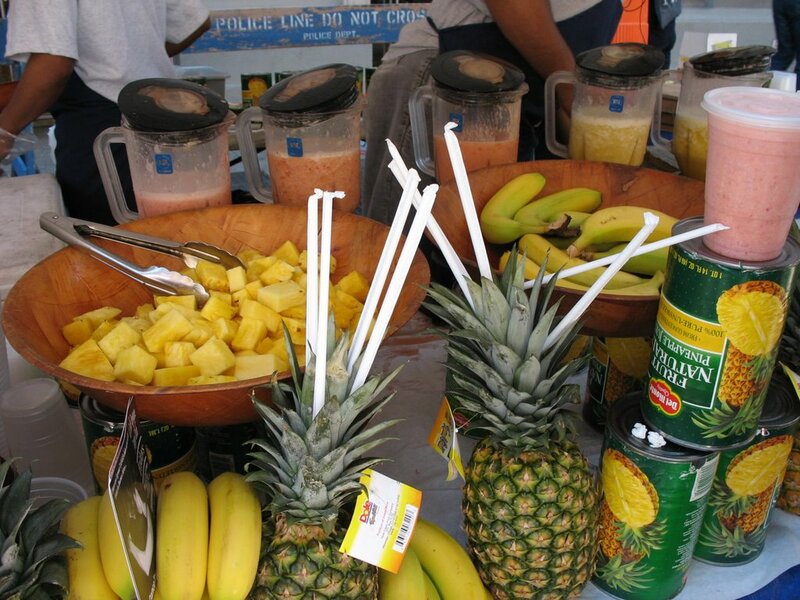 Fruit Shakes – these guys are at every street fair! So, how was I able to choose what to eat, given all these great choices? 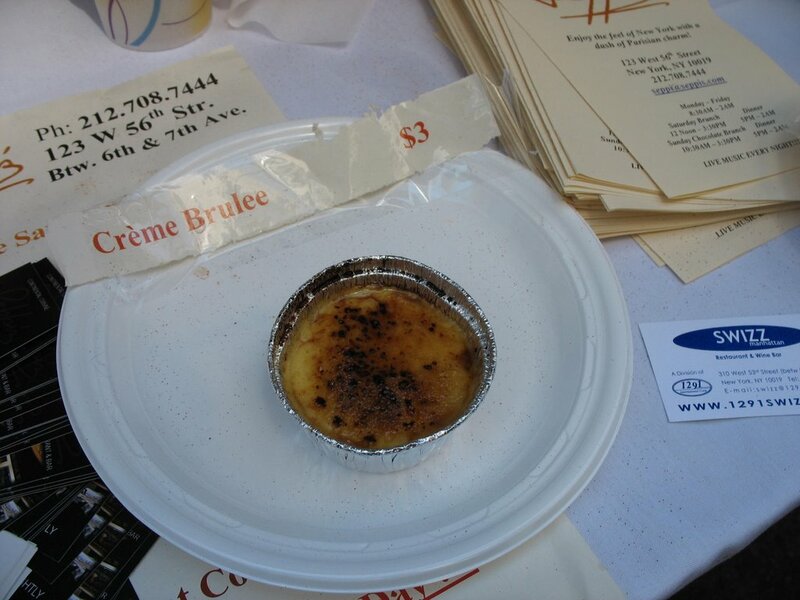 Well, I had a bit of an advantage in that I’ve been to this festival just about every year I’ve lived inNew York. That means that I sort of knew what to expect and how to pace myself. Rather than jumping in to sample everything right away from each stand that looked appealing, I walked west from Lexington (the start) to Fifth, got the lay of the land food-wise, and then walked back, making my selections along the way. I had decided in advance that I would limit my spending to $20.00 for my total food bill. At the end of my mini-feast, I was left with $4.00. 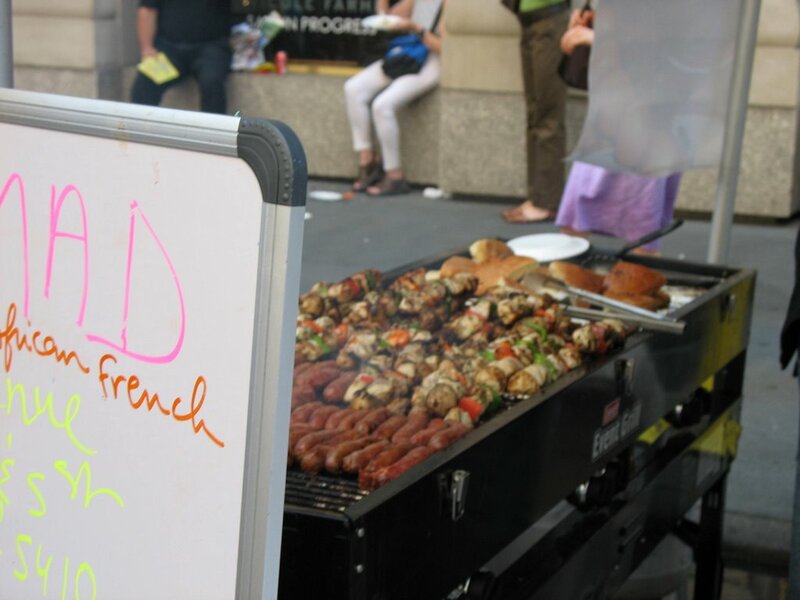 Hmm….what could I get with that? It was too little to buy a single lottery ticket to try to win a trip to France. The sweet crêpes would have put me a bit outside of my budget. Then, I remembered – aha! – Payard. “That sounds great,” I responded. “I maade eet myself, today, zis mornigk,” he replied, with what seemed to be a little extra, personal flourish. 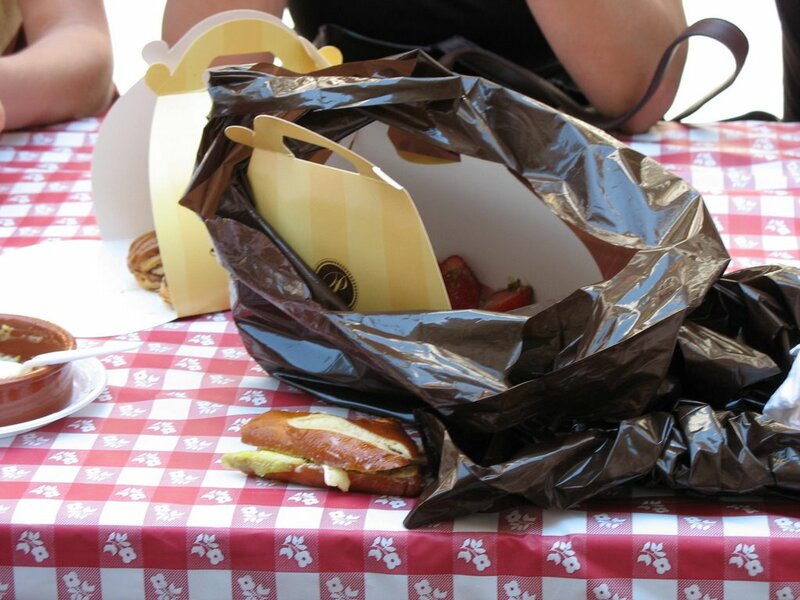 “I’ll take one to go,” I said. A sweet and a flirt, not a bad thing on a hot summer’s day! Bon Appétit! 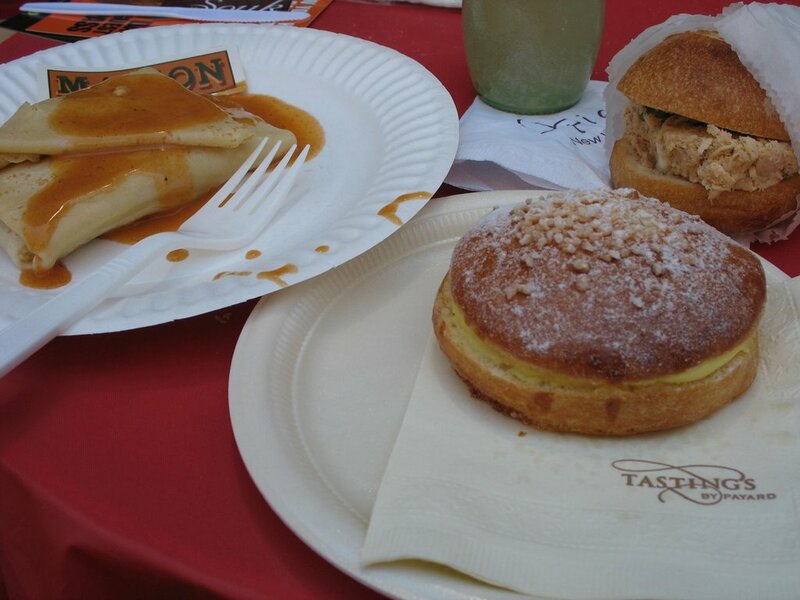 my sis was here last week and we went to paris, where we ate crepes with or as nearly every meal! she liked them so much she threatened to learn how to make them, and she doesn’t even cook (fish sticks don’t count! )…we’ll see if it actually happens…if so, i’m 1st in line! 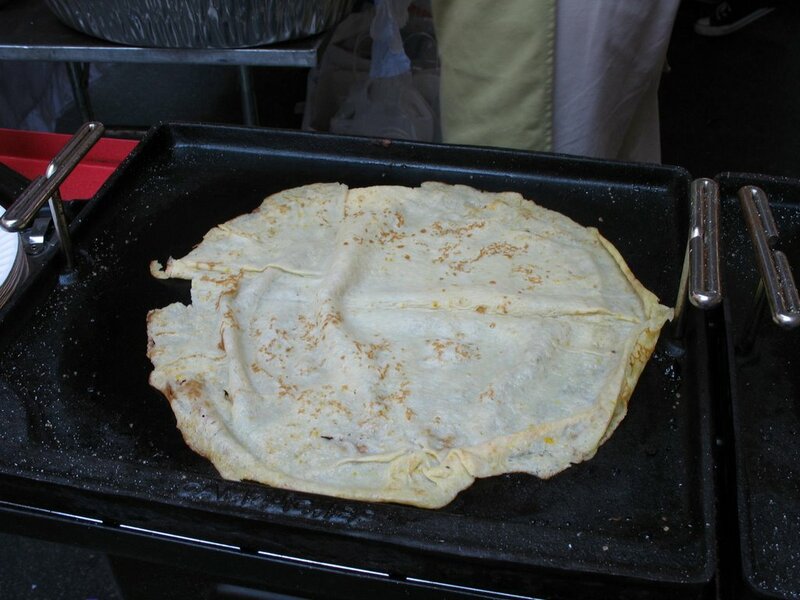 Jax – you can have a guest-bloggger post on this site if your sister makes those crepes. Our other brother lived in crepe-central in Brittany for his jr year of college. Yummy. I ate lots when I went to see him. They were very good w/ the local cider. My mom tried to talk me into letting her buy and bring back to the U.S. one of those large, black cooking stands on which they make the crepes. I don’t even think she could lift it! I love them. I don’t know why you had such a problem at the bakery stand. I would have just had one of everything. Ask Jackie about going to Portobello Market. 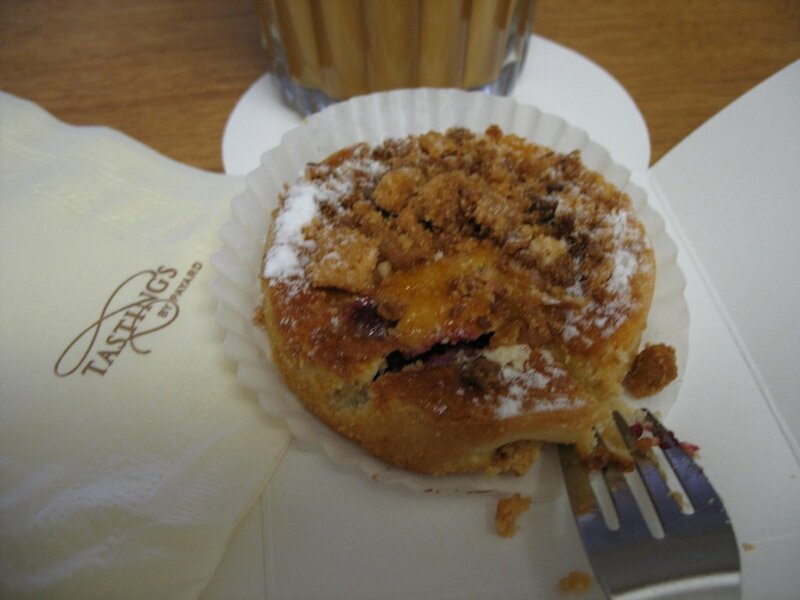 I usually grab a cupcake at the Hummingbird bakery and then swing by another bakery stand later down the road (after squeezing in a nice meat palate cleanser like at the bratwurst stand). 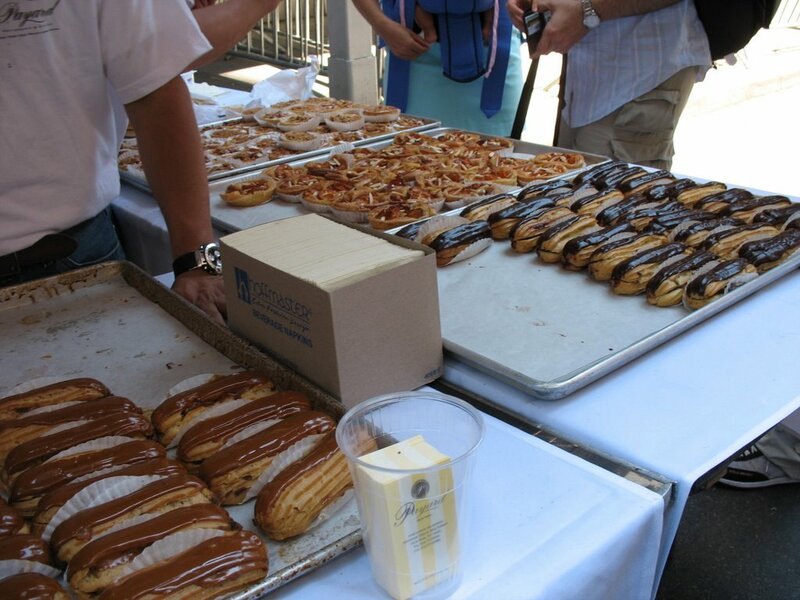 Well, I was trying to exercise some kind of restraint on the pastry front. So, how are the cupcakes in the UK? I’d heard that the wave in that sweets department had hit over there.